The guys at the Russian Academy of Sciences in Perm, Russia have released an application for converting ArcGIS 9 data into KML for use with Google Earth. KMLer is a commercial application costing US$20, they also have a free conversion application for ArcGIS called Typeconvert. You can view their samples page of Google Earth files. (Russian versions of these pages are available as well.) 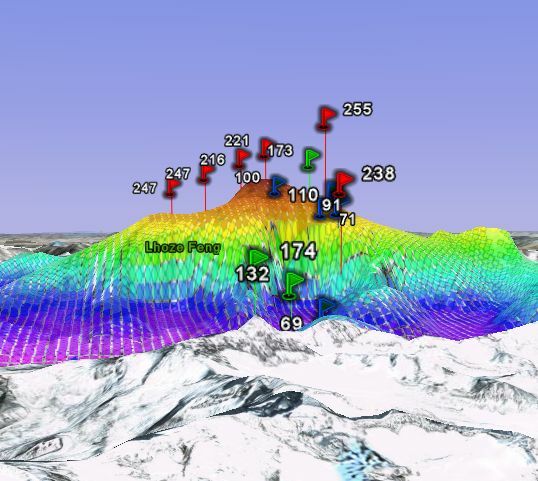 Here is an example of topographical elevation data for Mount Everest in GE. One of the guys from this lab has written and published numerous interesting Google Earth files at the GE Community, including ones I've written about: Tracking Birds, and World Designer. Both of these applications probably used earlier versions of these conversion applications. 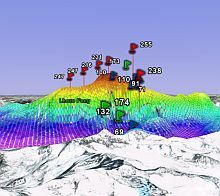 Once again, great work Valery35 and the Perm GIS team. Cpacibo! Great add-on for Google Earth. I used ArcGIS in college, and combining its capabilities with GE is fantastic.